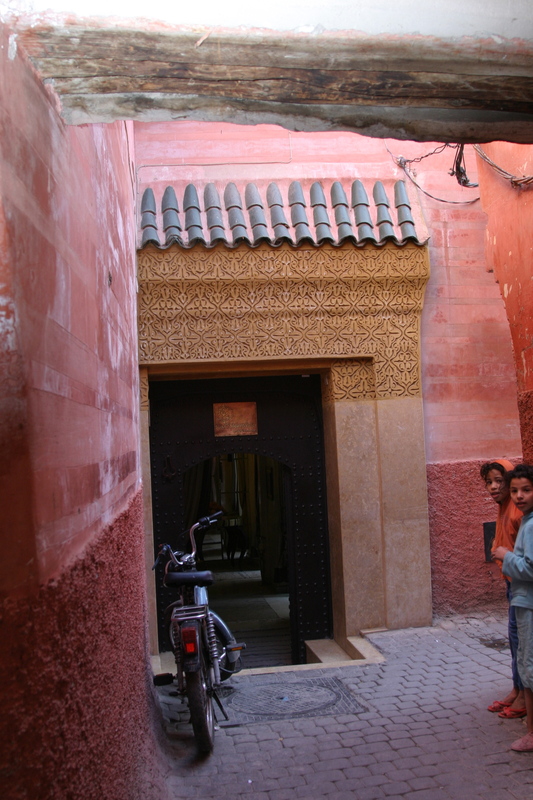 And the deceptive riad front door: Who knew there would be a sunny-ish courtyard oasis just inside? With clementines and dates and endless silver teapots filled with sugary fresh mint tea? 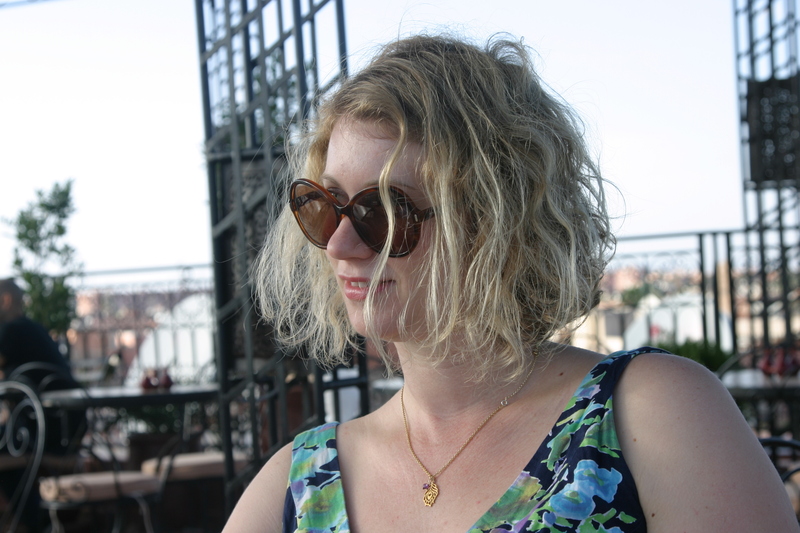 And here I am, on my first day in Marrakech, about to eat a decidedly average rooftop lunch, but very happy anyway, even though my dress was a little bit short and my pregnant belly just a little bit too sticky-outy. 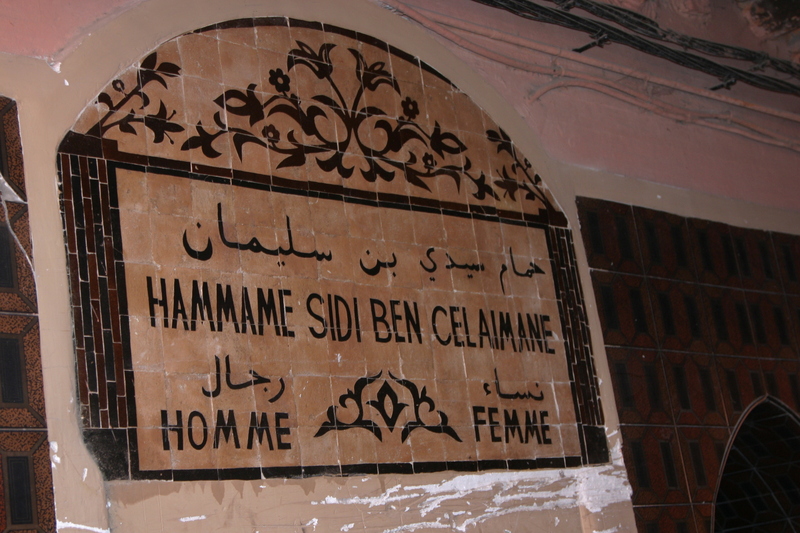 The sign for the traditional hammam. We didn’t go to that one, because it looked a bit scary. We went to the lovely posh one. But look! The sign is so lovely! Those things, and the excellent company of Jo and Rebecca, and the souks and the Berber musician-seller-guy who kissed up and made us buy castanets and ugly drums and the terrible charlatan reiki healer who fleeced me £40 and the annoying hotel guide Hakim and the wonderful lamb tajines and the scarves made from 100% pashmina (hmmmm) and the sun and the hammam and the TIME OFF FROM DEMANDING TODDLERS was all wonderful. On our first day I started bleeding a little bit. 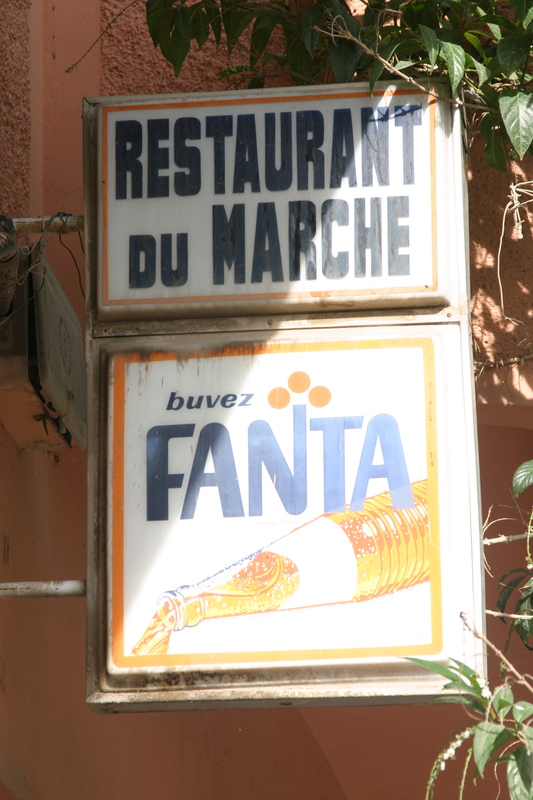 On our first morning in Marrakech I woke up to find a lot more blood. Throughout the day the bleeding continued and I figured out I was having a miscarriage. I thought I wouldn’t tell Mark, or go to a hospital, but just wait and see. By the afternoon, I was cramping and so we texted mark and he wanted me to go to hospital. We called a cab, and just as I was getting ready to go, I stood up and felt something come out in a flood. It was the placenta, along with a lot more blood. We got to the hospital with me bleeding everywhere. The hospital was scary, and there was very little English spoken. I was seen by a besuited doctor, obviously on-call and mid-way through his restaurant meal when we was called to me. He examined me and said that the fetus was still inside and he needed to give me an operation to remove it. I was separated from Jo and Rebecca and wheeled away, into a room with a young nurse who spoke English. She said I would have another baby, and she would be beautiful. The anaesthetist came in and pumped my arm full of drugs which stung like acid, then I fell asleep for half an hour, only to wake up and start sobbing. The nurses stroked my hair and asked me why I was crying and I said it was because I lost my baby. I was wheeled back into another room which had nothing in it, no flushing toilet, no supplies, and Jo and Rebecca found me. We stayed there for two hours, and I got cleaned up and was allowed to go back to the riad. I got to take the baby with me in a plastic container. That part was not good. I called Mark and he was so sad. So was I. So we still are. I have never understood why miscarriages affect people. I thought if you didn’t know your baby, and your baby was small, and not ready, then you would be ok if it died. But I see now that I was wrong. I am really sad about my baby. I feel empty, and wounded, and weak, and quiet. So, I am not pregnant any more, like I was, on Friday, when I arrived for my lovely weekend off. 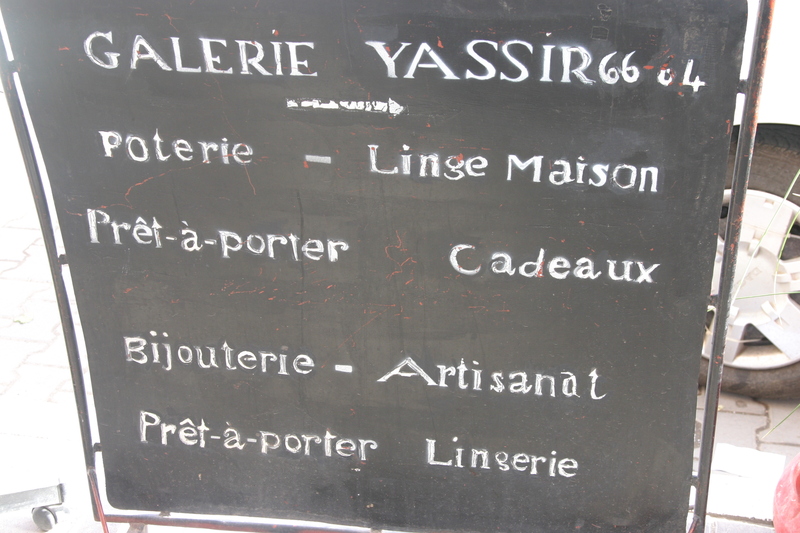 It was very odd leaving Marrakech thinner, emptier, older, wiser. I am tired, achingly-tired, and ready to sleep. I just thought you had to know. Oh Jodi. What a horrible, horrible, random thing to happen to you. All the love in my heart to you, my friend. Jodie, I am so sorry to read of Mark and your sadness and your miscarriage. I’ve also had to go through the pain you’re experiencing now and I know how much it hurts. It is a funny thing that although you’ve never met your baby, you still feel as if you know them, and you grieve their loss as you would that of any other member of your family. I guess that’s the only constructive thing I have to say at this time to you: Do grieve for your child. Don’t let anyone make you feel that you are less entitled to be sad because your baby didn’t grow to full term. Let the sadness and the pain and the anger and all the other feelings wash over you and be part of the experience now. Hopefully you will then be able to mend emotionally at the same time as you do physically and one day you will wake up and realise that it hurts less. In the meantime, much love and hugs to you and your lovely family. I don’t really know what to say; words feel a bit useless in the face of your loss. I am so very, very sorry to read about your miscarriage. You poor sweetheart. Sending you and Mark much love. I am so sorry, and I am glad you wrote about it. It can seem, in the abstract, before it happens, as if it could be OK, but of course of course of COURSE, no, it is just terribly sad. I wish this terribly sad thing had not happened to you. Take care of yourselves and each other. Oh Jodi. I’m so sorry and crying for you now. At school. I’m so so sad and sorry for you guys. Love you very much and see you in January sometime. Glad you were with good friends. Oh no…..I wasn’t expecting this. I was expecting that something humorously bad had happened to you. I am so sorry…must have been awful. To be so far away from everything you need. Oh dear. 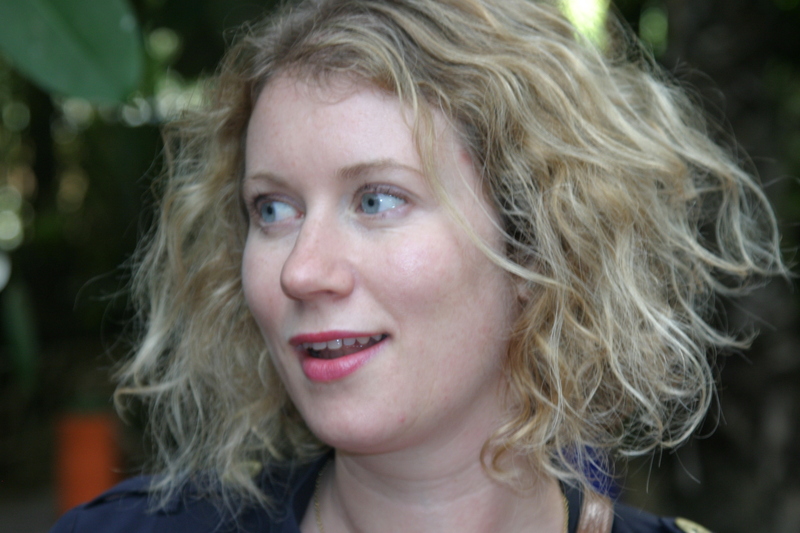 It took for me to have our second child (a Noah, like yours…..remember I met you in the communal garden with Kerry recently) to fully heal. Thinking of you muchly. A mother grieves for her baby whether is was a week old or fifty years old. Tomorrow is the awful first anniversary that my friend lost her baby. Still born at 6 months. She’d previously had three beautiful girls. I hope you are ok. Sharing is part of the healing. Oh Jodi, all my love to you and Mark. Oh, you poor, poor girl. What a dreadful, horriying thing to happen – and so far away from home and comfort. I’m so very, very sorry indeed. I am so, so sorry. I think it is very brave of you to talk about your loss.. I cried so much when I read this post that I thought my false eyelashes were going to float off. What a horrid, horrid thing to happen and in such an awful way. I hate that this can happen to ANYONE but to my beautiful sister in law…….#$%$$$#@!!! I am sooooo sorry! huge hugs to you and Mark and eternal gratitide to your friends who are physically with you and able to give you emotional support in this horrid, dark time. My dear jodi, i am so so very sorry for the both of you. it is very sad. i have had 4 of them, i know how you must feel. lots of hugs and my love to you my dear.please take care of yourself.